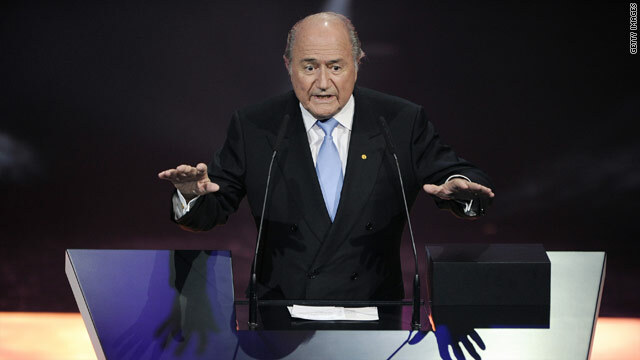 Speaking in Madrid FIFA president Sepp Blatter has given a strong indication that the 2018 World Cup will be held in Europe. FIFA president Sepp Blatter has given a strong indication that the 2018 World Cup will be staged in Europe. The news is a blow to bids from Australia, Japan and United States for the 2018 tournament would be ruled out with their bids for the 2022. Blatter said he had talked over the deal proposal with Michel Platini, president of European soccer's governing body UEFA. (CNN) -- FIFA president Sepp Blatter has given a strong indication that the 2018 World Cup will be staged in Europe after he revealed a consensus of opinion among the governing body's members favours the move. Russia and England have applied separately to stage the 2018 and/or the 2022 World Cup while Spain and Portugal and Netherlands and Belgium have made joint bids for one or both. But the news will come as a blow to bids from Australia, Japan and United States for the 2018 tournament would be ruled out with their bids for the 2022 edition going forward to compete against proposals from South Korea, Indonesia and Qatar. "There is a movement at the moment among the various candidates that in the end it would be a good solution ...if the candidates for 2018 would only be those from Europe," Blatter said at a news conference in Madrid where he was set to meet Spanish Prime Minister Jose Luis Rodriguez Zapatero. It would be a good solution if the candidates were from Europe. "It's not been finally decided but it's the idea, also to make the work of FIFA easier and especially that of the executive committee. "It would also possibly make the work of the different organisations applying for the World Cup easier." FIFA will unveil which nations will host the tournaments in 2018 and 2022 in Zurich in December.